Getting started -- Use small pots or cups with drainage holes. For soil, use a well-draining mix. A typical mix is 2 parts potting soil to 1 part perlite (use small- or medium-size perlite, not large chunks) or coarse sand. An alternate mix is 1 part coir fiber to 1 part perlite (use small- or medium-grade, not large). If you use peat moss instead of coir fiber, add a small amount of agricultural lime (dolomite lime, not hydrated or quick lime). Fill the pots with soil, place a seed or 2 on the surface, and tap the pot a few times so the seeds settle into the cracks in the soil. 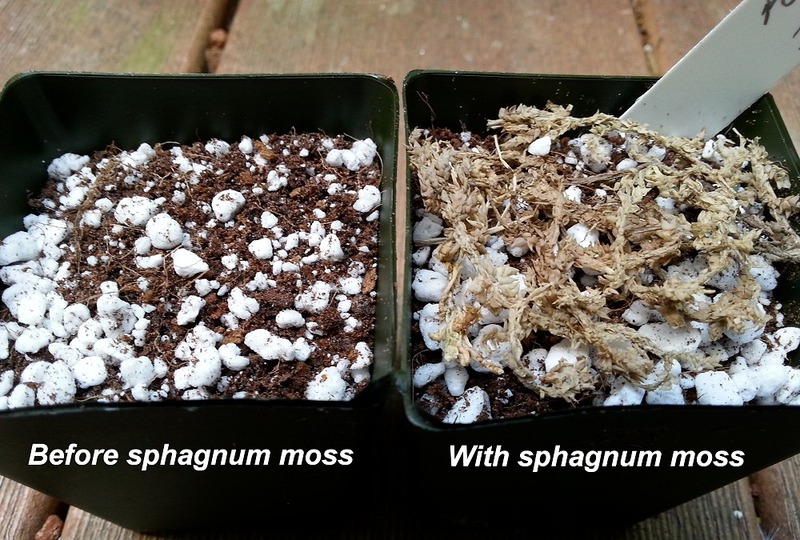 If you have long-fibered sphagnum moss , sprinkle a small amount over the surface. This helps retain moisture around the seeds while allowing light to reach them, which aids germination. The amount of moss to use is shown in this photo. If you don't have the moss, sprinkle a small amount of your soil mix around the seeds. Then add water until everything is evenly moist (but not fully saturated). Until the seeds sprout, ensure that the surface soil always stays moist. A plastic dome or bag may be used to maintain moisture, but leave it open slightly to allow some fresh air in. You may need to drip a few drops of water over the seeds every day to keep the seeds moist. The ideal temperature for germination is between 65 to 77 degrees F (18-25°C). Slightly cooler at night is ok. Avoid letting them get above 80° F (27°C). I recommend placing a minimum/maximum thermometer near the pots, especially if using a heating mat. Keep the pots in a bright spot out of direct sun. A fluorescent or LED bulb kept 4 inches (10 cm) away provides the right amount of light. They should start germinating in about 3 to 6 weeks, but allow up to 8 weeks. For the first 2-3 weeks after sprouting, continue keeping the soil surface moist. Fertilizing -- Once they are 1 week old, give a small amount of liquid fertilizer (about 1/8 strength), and repeat every 7-10 days. Hydroponic fertilizer is ideal for young seedlings, since it is easily absorbed and complete. Once they are 6 weeks old, you may switch to a granular, general-purpose fertilizer, following the dosage and frequency on the package, or about every 2-3 months. Watering -- Aim to keep the soil moist, but not soggy, most of the time. You may use a moisture meter probe to monitor the moisture levels down in the root zone. Transplanting -- When your plants are 2-3 months old, you may gently transfer them to a larger pot. Water the soil first, and avoid letting the soil ball break apart, which can damage the roots. After transplanting, avoid packing the soil down, and do not fertilize the first week. 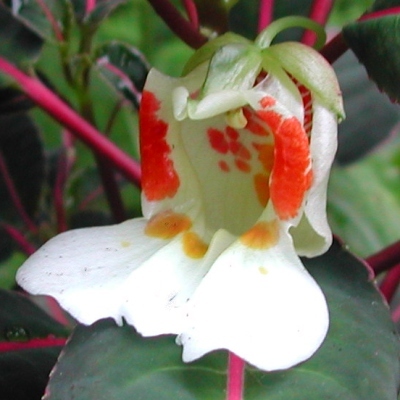 Climate -- This Impatiens prefers mild temperatures. It should have a minimum of 50 degrees F (10° C). I have no information on how much heat it can take, but it's possible that it may not thrive if temperatures are consistently above 85° F (30°C), particularly if nights are warm. Over about 40-45% humidity is best. If your plant seem to suffer from low humidity indoors, consider using an ultrasonic room humidifier, sold at home improvement stores and some thrift shops. It's normal for an older leaf to occasionally turn yellow and drop, but if it seems excessive, check that the soil is moist enough down in the root zone. If you're certain the roots have been moist enough, the plant may need more fertilizer. Pests to watch for -- Look for any pests that can affect your other plants. Try using insecticidal soap spray before using stronger remedies, since some may harm the plant. Contact me if you have questions.